Snowy Egret pair building a nest and showing their nuptial plumes. Photo by Cindy Margulis. Rounding the bend of the lagoon trail, the first things you hear are the guttural calls. For such spectacular, graceful birds, great egrets and snowy egrets calls are closer to what I imagine a pterodactyl might have uttered. For the last six years, both these species have nested in a small colony on Alameda’s Bay Farm Island, on a prime lagoon location in a pine tree. Cindy Margulis, a local resident and volunteer Citizen Scientist, began watching the colony five years ago. She volunteers with the San Francisco Bay Bird Observatory (SFBBO), providing them with data on the colony for their Colonial Waterbird Monitoring Program. 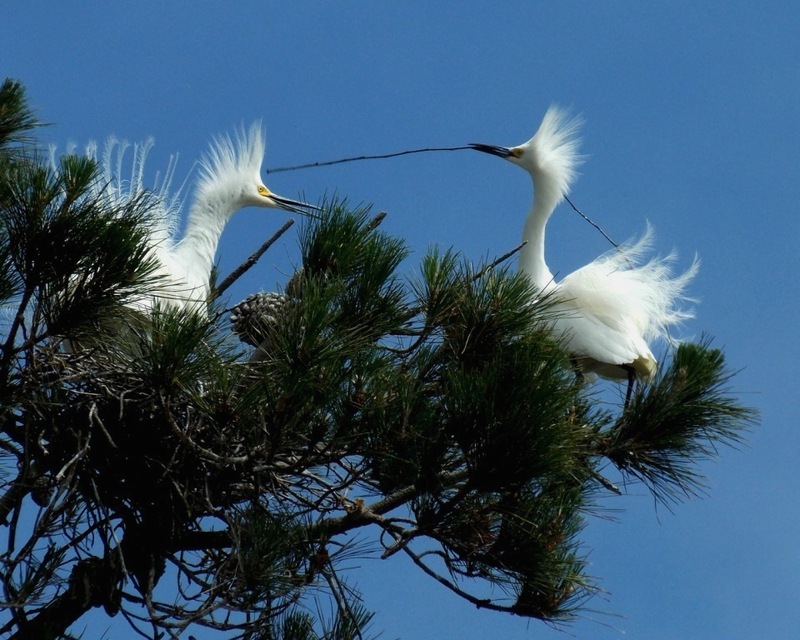 This year, there are 12 great egret nests and 10 snowy egret nests all in the same pine tree. Though it might seem like a small number compared to other colonies with hundreds of nests, it’s very important for its location and the number of nests from the two species. Great Egrets build their nest in the same tree. Photo by Cindy Margulis. Cindy’s time with the colony, year after year, has rewarded her with some keen observations and a chance to protect the colony. She has even observed the apparent use of tools in this colony of egrets. Herons have been filmed using bread as lures for fish. As egrets are in the same family, it seems they’re capable of the same brainpower. Cindy observed one snowy egret that was chased backward by a great egret on a branch of the pine tree and fell partially through the canopy with its legs stuck below and wings spread above the branches. It was stranded for several hours until another snowy egret fetched a 4' long stick, almost too large for it to carry. It wedged the stick under the trapped egret, which enabled it to climb out and free itself. 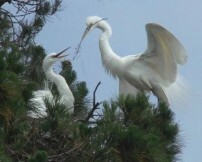 The same pair of egrets later proceeded to build a “small cappuccino cup” of a nest, as Cindy says, and fledged two young that year. Several years ago, the property management company began cutting down some of the trees along the lagoon. Concerned citizens took quick action to contact authorities and save the trees, unfortunately not before one outlying colony’s tree was abandoned due to the disturbance. Hopefully, the local residents around the lagoon and the property management company will come to understand how special and important the annual return of the egrets to their nesting colony is and work to protect them.